Atmospheric, well located and very comfortable sum up our stay at No.39. After the hustle and bustle of the fort, diving in and out of cafés and boutiques, and photographing iconic landmarks, it was heaven to return to our tranquil and comfortable abode, which was right at the heart of everything. Ajith, the housekeeper, welcomed us in his quiet way, always with a shy smile and, with assistance from a second member of staff, kept the house clean and tidy. He was also the cook, and although still a novice in the kitchen, we were pleased with his efforts, especially his curries. The menu is fairly limited but included grilled fish, salads, sandwiches and kids’ meals – all dishes Ajith felt confidant cooking. Although this is a great family house, the cement stairs (sans stairgates) and minimal kids’ facilities make it less suitable for toddlers. That said, there are two daybeds at the entrance to the master bedroom that can sleep children up to ten years old. The soft pillowy quilts made the beds very comfortable and we particularly loved the upstairs bedroom for its extra space and breezy rooftop views. We found the bathrooms to be fairly small, but all were nicely finished in smooth polished cement. Note that Ajith is a live-in housekeeper and spends much of his time in the kitchen or discretely in his quarters, which are located next to the garden bedroom. The rural setting of Ivory House is undeniably idyllic. Often when you stay on the coast you miss out on experiencing the island’s lush, rural hinterland. Here you can enjoy the best of both worlds as beaches are accessible in 10-15 minutes (there are plenty of local sprays of sand for sunbathing). Families will find this house suits them well; the gentle lawns and shallow ledge of the pool are both child-friendly. The villa’s wraparound veranda makes the most of the rural environs, and although it is scantily furnished with only a round table for six, there are loungers in the garden and beside the pool. Wide folding doors bridge the gap between indoors and out, and thanks to their location to the front of the house, the huge living room and the front master suite benefit most from the rural vistas. The second master bedroom is tucked behind, but has its own side veranda, whilst the remaining two bedrooms – one of which is very small and would suit a single traveller, a child or perhaps even a nanny – open onto the living room. The staff looked after us well and we were happy with the chef’s cooking – amongst other items, his sweet potato and coriander soup was delicious. We’d also recommend the Sri Lankan breakfast. Also try to visit the nearby Kahanda Kanda hotel for afternoon tea or a meal at least once during your stay. The Old Lady at the Sea offers excellent value for money, especially when filled to its full capacity of 20 guests. 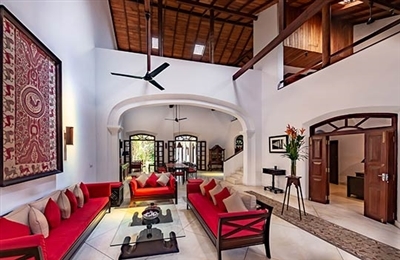 The villa is also very well situated – right beside the sea and only a short drive to both Hikkaduwa and Unawatuna beaches, as well as Galle’s famous fort. Despite touches of modernity in the form of terrazzo floors, air conditioning and TVs/DVD players, we thought that the ‘Old Lady’ felt more old-fashioned than fashionably colonial. It is, however, kept spick and span by the friendly staff who are led by a manager who made every effort to help and please. The female staff and the manager share the cooking, and each has their own speciality dish. Guests may also self-cater as and when they wish. We also noticed that bedrooms and bathrooms in the ‘Old Lady’ were a little smaller and darker than the ‘Young Lady’s’ rooms, which opened straight onto the pool and garden. For in-villa entertainment there’s a good stock of DVDs and CDs, as well as five iPod docks, and for things to do beyond the villa there are a number of restaurants, shops, activities and beaches within a 15-minute drive.